Our Consulting Partnership helps you understand your market position, transform your process and develop a strategy to win digital to grow your revenue and cut cost. Get a 360-degree view of your Digital Marketing strategy, uncover insights about your business across the 8 Channels of Digital Marketing, and tap into the power of principle-based recommendations. We institutionalized Digital Marketing into eight distinct channels, and your Digital Transformation Audit covers all of them: Website, SEO, Content Marketing, Email, Digital Ads, Social Media, Local Search and Reputation Management. To effectively lead a Digital Transformation or successful marketing campaign, you need the right People, Platforms, Partners, and Process. Our audit will analyze all four of these areas. We’ve boiled down your Digital Marketing success to 236 data points across the 8 Channels of Digital Marketing and we audit every single one for you - giving you performance scores for each and recommendations to improve your scores based on best practices. Our Digital Transformation Audit includes performance scores for every part of our 236 Point Inspection. Scores range from A - F. We tell you exactly why you received your performance score. If your score is below an A, we provide recommendations to improve your score based on best practices. As part of the Digital Transformation Audit, our team conducts competitive research for your top three competitors, giving you insight into your market position across the 8 Channels of Digital Marketing. Included in your Digital Transformation Audit we provide actionable recommendations based on current best practices for any of the 236 data points you score low on across all 8 Channels of Digital Marketing. Make better marketing decisions based on your Digital Marketing Goals, Objectives, Strategies, and Tactics. Our Fratzke Media Consultants are here to help. You have access to our team of solution engineers, developers, designers, and writers to bridge the gap between where you are, and where you want to go! We can solve all of your Digital Marketing roadblocks. Leverage our Marketing Strategy Stack to get in alignment with the best of the best. We’ve worked with and studied some of the most successful Digital Marketing brands and compiled the essential marketing materials they use in one place - and they're all at your disposal. Your Fratzke Media Consultant will leverage the Digital Transformation Audit to proactively ensure that you have the right people in the right places and recommend training and development opportunities. We consult on the best platforms for your brand to leverage. Our team can test, vet, negotiate, recommend, and train your team. Fratzke Media is on your team. Our Consulting Partnership is laser-focused on your Return on Investment. Our team is equipped to analyze all your digital partnerships and ensure they are in alignment with your digital marketing goals. Through our Digital Transformation Audit and Marketing Strategy Stack, our Consultants will analyze your internal processes and ensure they are in alignment with the high performing digital marketing brands. Make your job easier with an actionable path forward, project management, hands-on execution, and real-time updates. All of our recommendations from the Digital Transformation Audit will be transformed into executable tasks in your customized Prioritized Action Plan. Access your Prioritized Action Plan at any time to see how our team has prioritized and assigned every task. Our team actively manages your action plan so you don’t have too. Our Consulting Partnerships include Hands-on Execution which means our team will complete each task. Understand what’s happening with your Digital Transformation with target dates and real-time email updates from our team when work needs review or is complete. Make better decisions faster with one-page channel-specific blueprints for all 8 Channels of Digital Marketing. Fratzke Media works with you to define your business and marketing goals. We leverage your desired future result to establish the right objectives to track. Our Consultants use your goals to establish specific, measurable, achievable, relevant and time-bound objectives that clearly align with your goals. Our team works with your goals and objectives to implement winning strategies to help you achieve your measurable and timely objectives. This is where the rubber meets the road. Our Consultants plan and outline specific actions tied to your strategies. Your tactics will be added to the Prioritized Action Plan and assigned. Transform your Digital Marketing strategy with our marketing stack. Everything your team needs to win digital in one place. Our Consulting Partnership includes the 20 essential Digital Marketing documents all the Best Brands use to win. This includes your Content Calendar, Customer Personas & SEO Keyword Research. We use our Marketing Strategy Stack to help get your brand's digital strategy in alignment with the best of the best. Leverage our jumpstart strategy sheets to help your team establish core Digital Marketing metrics, such as Customer Acquisition Cost and Customer Lifetime Value. These metrics help inform your entire marketing strategy. Understand how your brand is performing across the 8 Channels of Digital Marketing and identify opportunities to reach more customers. At Fratzke Media, we believe a successful partnership is measured by results, not activity. Our ROI model tracks how much money you’re spending on marketing and how much you’re making back. Our Consultants tell you what's working and what's not - what needs to be cut, or what needs more fuel for the fire. Our attribution model helps you determine how Fratzke Media’s Consulting efforts across the 8 Channels of Digital Marketing impacts your sales and conversions. You can expect similar results as our other clients - more sales, site traffic growth, increased search visibility, increased profits and more. 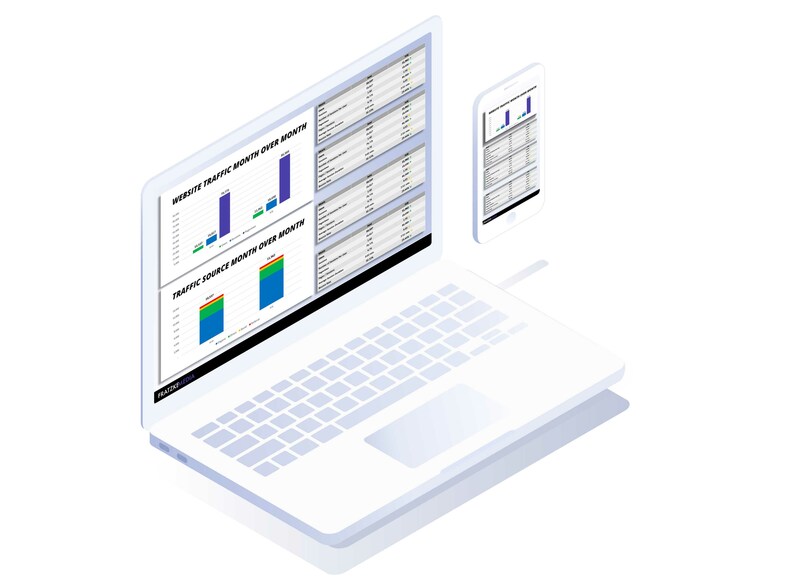 Understand and visualize your Key Performance Indicators all in one place. 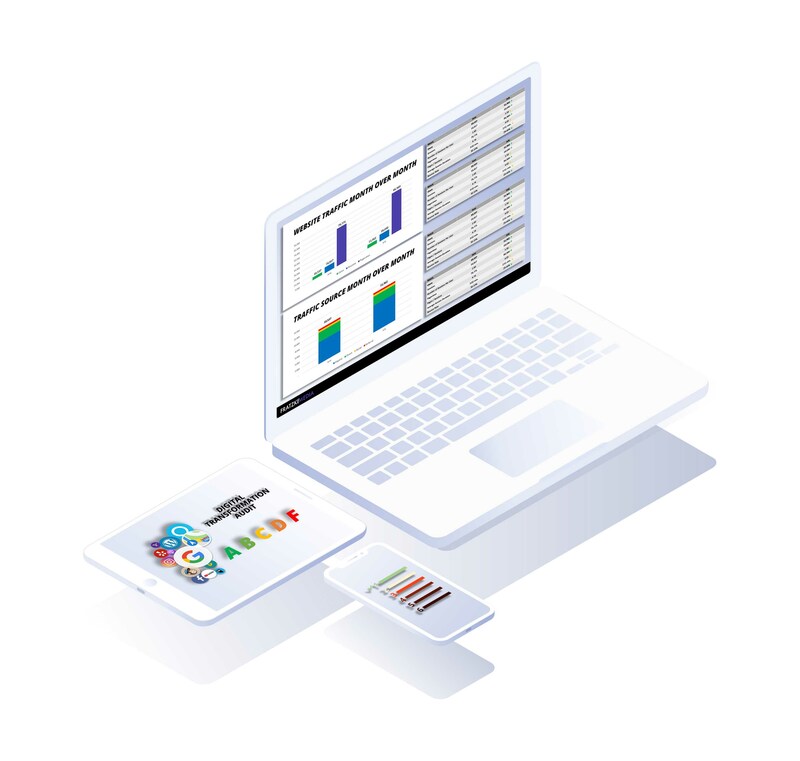 We leverage Google Data Studio to connect all the dots between your platforms and reporting tools, so you see only your KPIs across the 8 Channels of Digital Marketing. Our monthly Digital Marketing reports offer a variety of ways to visualize your performance against your Goals, Objectives, Strategies, and Tactics across all 8 Channels of Digital Marketing. Our consultants will unpack your reports and share actionable insights. Our Fratzke Media Consultants leverage the industry-leading SEMRush SEO toolset to provide best in class SEO reporting. Monitor organic search visibility for primary and secondary keywords. Track competitor ranking distribution versus yours and take action. Fratzke Media leverages Google Analytics to surface insights from your web traffic. We monitor key changes, new trends, and other opportunities and share them with you in real-time. Fratzke Media offers Owner-Operator, Enterprise, and Executive Consulting Partnerships all tailored to your specific needs.